At the 2011 Google I/O developer’s conference, Google announced a new initiative called “cloud robotics” in conjunction with robot manufacturer Willow Garage. Willow Garage and a variety of other contributors have developed an open source (free) operating system for robots, with the unsurprising name “ROS” — or Robot Operating System. ROS is being positioned as the MS-DOS (or MS Windows) of robotics. With ROS and a package called “rosjava“, software developers will be able to write code in the Java programming language and control robots in a standardized way — much in the same way that programmers writing applications for Windows or the Mac can access and control computer hardware. Google’s approach also offers compatibility with Android. Robots will be able to take advantage of the “cloud-based” (in other words, online) features used in Android phones, as well as new cloud-based capabilities specifically for robots. In essence this means that much of the intelligence that powers the robots of the future may reside on huge server farms, rather than in the robot itself. While that may sound a little “Skynet-esque,” it’s a strategy that could offer huge benefits for building advanced robots. A housekeeping robot would need to be able to recognize hundreds or even thousands of objects that belong in the average home and know where they belong. In addition, it would need to figure out what to do with an almost infinite variety of new objects that might be brought in from outside. Designing computer software capable of recognizing objects in a very complex and variable field of view and then controlling a robot arm to correctly manipulate those objects is extraordinarily difficult. The task is made even more challenging by the fact that the objects could be in many possible orientations or configurations. Consider the simple case of a pair of sunglasses sitting on a table. The sunglasses might be closed with the lenses facing down, or with the lenses up. Or perhaps the glasses are open with the lenses oriented vertically. Or maybe one side of the glasses is open and the other closed. And, of course, the glasses could be rotated in any direction. And perhaps they are touching or somehow entangled with other objects. Building and programming a robot that is able to recognize the sunglasses in any possible configuration and then pick them up, fold them and put them back in their case is so difficult that we can probably conclude that the housekeeper’s job is relatively safe for the time being. Cloud robotics is likely to be a powerful tool in ultimately solving that challenge. Android phones already have a feature called “Google Goggles” that allows users to take photos of an object and then have the system identify it. As this feature gets better and faster, it’s easy to see how it could have a dramatic impact on advances in robotics. A robot in your home or in a commercial setting could take advantage of a database comprising the visual information entered by tens of millions of mobile device users all over the world. That will go a long way toward ultimately making object recognition and manipulation practical and affordable. As in the object recognition example, robots will be able to take advantage of of a wide range of online data resources. Migrating more intelligence into the cloud will make robots more affordable, and it will be possible to upgrade their capability remotely — without any need for expensive hardware modifications. Repair and maintenance might also be significantly easier and largely dealt with remotely. As noted in the video below, it will be possible to train one robot, and then have an unlimited number of other robots instantly acquire that knowledge via the cloud. As I wrote previously, I think that machine learning is likely to be be highly disruptive to the job market at some point in the future in part because of this ability to rapidly scale what machines learn across entire organizations — potentially threatening huge numbers of jobs. The last point cannot be emphasized enough. I think that many economists and others who dismiss the potential for robots and automation to dramatically impact the job market have not fully assimilated the implications of machine learning. Human workers need to be trained individually, and that is a very expensive, time-consuming and error-prone process. Machines are different: train just one and all the others acquire the knowledge. And as each machine improves, all the others benefit immediately. Imagine that a company like FedEx or UPS could train ONE worker and then have its entire workforce instantly acquire those skills with perfect proficiency and consistency. That is the promise of machine learning when “workers” are no longer human. 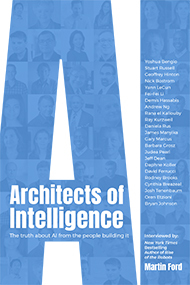 And, of course, machine learning will not be limited to just robots performing manipulative tasks — software applications employed in knowledge-based tasks are also going to get much smarter. The bottom line is that nearly any type of work that is on some level routine in nature — regardless of the skill level or educational requirements — is likely to someday be impacted by these technologies. The only real question is how soon it will happen. Martin: How do you think the public will react and the politician’s stories will evolve as jobs are replaced and lifespan increases? Social Security will blur the path. Very interesting talk illuminating exciting applications of mobile devices and cloud computing for robotics. Willow Garage developed ROS not google. Thanks. I have updated the post. Google do some great stuff but google goggles for me I found hopeless. Came across an interesting article about the transformation of manufacturing. I read the Atlantic article, very good. It’s just the beginning. There are many comments on how we must improve education to get everybody working. It’s better to be educated and be out of work than to be uneducated and be out of work. It’s not going to stop the march of the machine, nor should it. 20 or 30 years of pain for many as new economies will need to form. The old Socialist/ Capitalist/ Regulationist ménage à trois systems of today will not cope. Just think about a robot, or any AI bot, that can plug into Google, scan the net and learn from the answers. It could learn about almost any subject without outside input. Sounds crazy? – not really, people are working on it already (sorry, don’t have a reference, probably on Kurzweils ai.net email post somewhere). 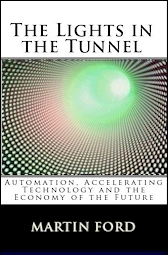 BTW, just skim read ‘Lights in the tunnel’ – excellent attempt at a problem that has been nagging me for decades – ever since I read scifi stories about completely automated societies – great, I thought – but how do people get paid?. Sorry, but I dont think the lights analogy works well – maybe it would with a video illustrating it. Verbal descriptions of essentially visual pictures are not usually successful. One of the most important cloud-based robotic capabilities is certain to be object recognition.